Double click an empty area in the calendar view, while a note calendar is active in the Calendar List, to create a new note. Double-click an existing note to open it. Right-click the calendar view and select the "New Note" command from the popup menu, or the "Open Note" command if a note is clicked. Create a new note using the "New -> Note" command on the File menu, or press Ctrl+Shift+N. Create a new note for a contact via the right-click menu in the Contact List or the toolbar in the Contact Editor. Create a new note link via the Links tab in the various editor windows. Click the title of a note in the Details pane..
Open a linked note from the Links tab in the Task Editor, Event Editor, or Contact Editor. The Note Editor enables you to create new notes or modify existing ones. Notes are simple free-form text blocks that can be optionally pinned to dates. These can contain anything you'd like, such as recipes, shopping lists, journal entries, daily devotions, or anything else you'd like to keep track of, and that doesn't make sense to be defined as an event or task. A full-featured WYSIWYG editor is used to enter the content of notes, which can include formatted text, links to files or web pages, pictures, and more. There's also no limit to the length of a note. When using the Ultimate version, custom data fields can be defined on the Custom tab to contain any data that doesn't fit well within a note's text description. 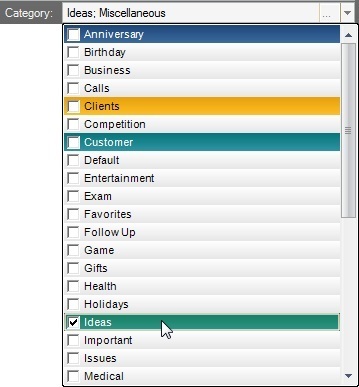 The calendar and category associated with the note are displayed at the top of the Note Editor window. The note will belong to the specified calendar. 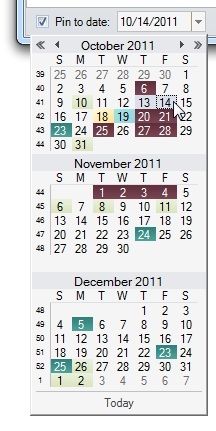 Clicking the drop-down arrow will display a list of all note calendars. You can type a different calendar name to add the note to a new calendar. The note calendar will be created after closing the Note Editor window. When opening an existing note, you can use the Calendar field to reassign the note to a different calendar. Notes can be associated with zero or more categories. A toolbar appears at the top of the Note Editor, providing a number of commands. Save And Close - Saves the note and closes the editor window. The keyboard shortcut is Ctrl+S. Save - Saves the note but leaves the editor window open. Save and New Note - Saves the note and creates a new note in the same editor window. The keyboard shortcut is Ctrl+N. Delete - Deletes the note and closes the editor window. The keyboard shortcut is Ctrl+D. Print - Prints the note. The keyboard shortcut is Ctrl+P. Email - Initiates a new email using your default email program. The body of the email is initialized from the current note. The keyboard shortcut is Ctrl+E. Previous/Next Note - Saves the current note and opens the previous or next note in the same editor window. The next or previous note is found by using the pinned date of the current note and searching backward or forward in time until another note is found. The keyboard shortcuts are Alt+UpArrow and Alt+DownArrow. Notes can be optionally pinned to dates. When pinned to a date, the note will be visible in the Calendar View, unless the View menu option "Show Notes in Calendar" is disabled. When unchecked, the note will only be visible in the Notes List. To pin a note to a date, check the "Pin to date" box at the bottom of Note tab in the Note Editor, and then either type in a date or select a date from the drop-down button. 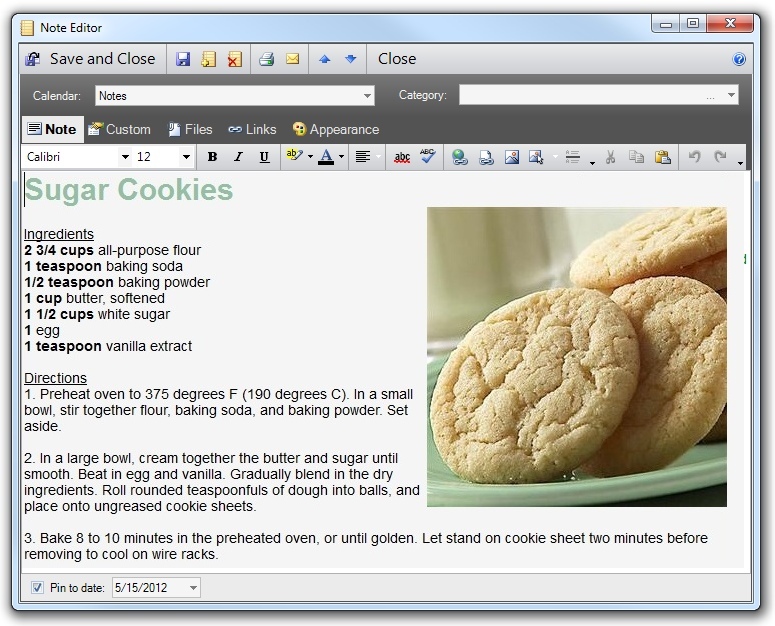 The note text can be entered on the Note tab using a full-featured WYSIWYG editor. This text will appear in the Details Pane when the note is selected, as well as the note's tooltip when hovering the mouse over the note in the Calendar View. If the note contains links to web pages or files, those links will be clickable in the Details Pane. You can also hold the Ctrl key while clicking a link in the note editor to open the link. VueMinder Ultimate provides the ability to define custom data fields for notes via the Custom tab of the Note Editor. Custom data can also be imported or exported, and will sync over a local network when using VueMinder Server. See the Custom Data documenation for more information. Any number of file can be attached to the note (as links), using the Files tab. The files will appear in the Details Pane when the note is selected. Files can be opened from the Files tab by double-clicking or using the Open command on the toolbar and right-click context menu. More information can be found here. Notes can be linked with other notes, tasks, events, or contacts by using the Links tab. When a link is created, it becomes 2-directional, meaning a backlink to the note will be automatically added to the linked item. Linked item details will be shown on the Links tab. For example, when a note is linked to a contact, the Links tab will show the associated contact's email address and phone number. More information can be found here. The appearance tab enables an appearance to be specified for the note. This appearance will override any associated calendar or category appearance. To reset a customized appearance, click the "Reset Appearance" button, or uncheck the appearance override checkbox. More information can be found here.